Using a remote control car to research Penguins. 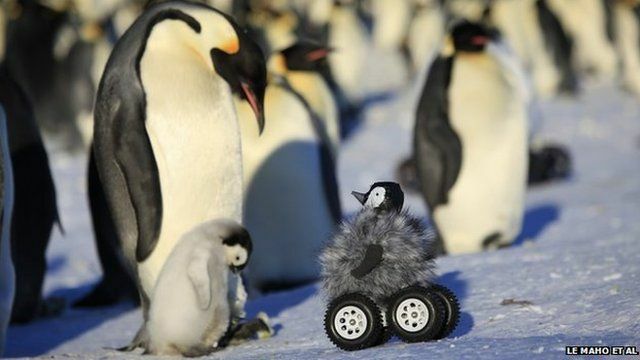 This is slightly hilarious, scientists are using a remote controlled baby penguin to get closer to the notoriously shy Emperor Penguins. A remote-controlled vehicle disguised as a chick has allowed researchers to gather data from notoriously shy emperor penguins. As well as getting closer to the birds, the diminutive rover also had much less impact on penguin behaviour than being approached by a human. Scientists say the unusual approach provides "a less invasive and stressful way to collect data on these species". The findings are published in the journal Nature Methods.